Soviet citizen reading the news/announcements. 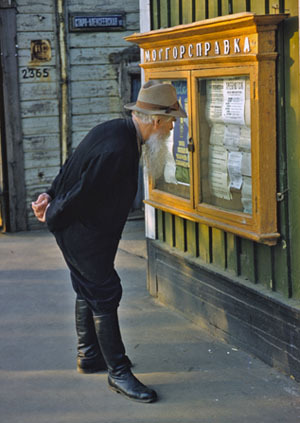 These informational galleries (spravka) were usually located throughout the city and were a place where people could go and read the newspaper, or other information, that was posted there. Read chapter 1 from Mary Platt Parmele (1843-1911) A Short History of Russia (1907, 4th edition). I will include some excerpts from this old textbook throughout the course, since Parmele provides a rather standard (and interesting) impression of Russian history from the early twentieth century, before the Bolshevik Revolution. This is optional reading. If you wish, you can download the entire book.